So you are considering solar hot water for your home? Why not consider heating your water with a full home solar power system? By doing this you will save incredibly on expensive solar hot water equipment and tubes not to mention the substantial labor cost involved. 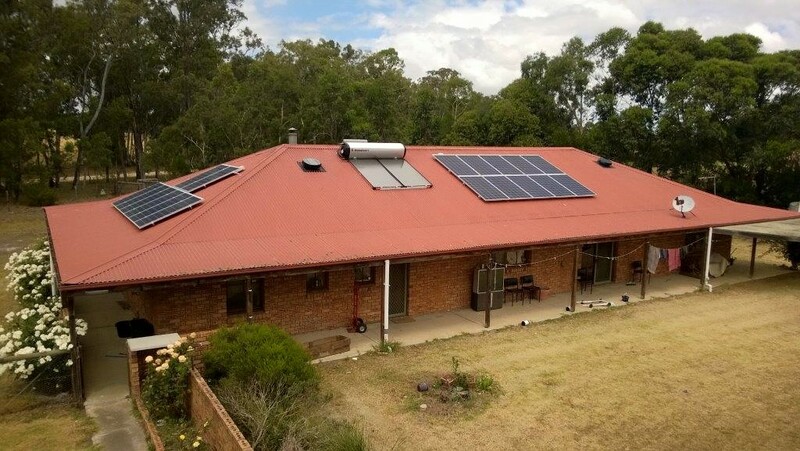 By putting in a main solar power system in your home, you will have the benefit of saving substantially on your home electricity bill and at the same time, you will be able to connect your electric hot water tank to the main solar power system. Government rebates for main solar power are significantly greater at up to $4,000.00 vs. $1,000.00 for solar hot water systems. You end up paying for only one installation cost, you have only solar panels on your roof therefore, maximizing the roof space you have. Solar hot water panels and tubes interfere with main solar power panel placement and are a really unsightly combination on your roof. Lets give an example here. Below you will see this house with a solar hot water system occupying vital roof space for the task of heating water only. Next to the solar hot water system is 10 x 250 watt panels totaling 2.5kW. On the east facing side of the house you will also see an additional 8 x 250 watt panels totaling another 2kW for a total between both arrays of 4.5kW. On a daily average in Queensland, the main solar power panels will generate between 22kW – 26kW per day for the house to use. So what about instead of paying for a double labor cost to have a solar hot water specialist come out to put in a very specific solar appliance only for hot water, why not instead save the extra costs of equipment and labor and simply add another 10 panels in its place like below. By adding more solar panels instead of a specific solar hot water system, you are saving on installation labor costs, high solar hot water equipment costs and you now will have extra generation of 10 x 250 watt panels totaling 2.5kW which is approximately an extra 15kW per day for the house to use including your electric hot water tank. This house now has 28 x 250 watt panels totaling 7kW! Makes sense? Also, for those of you with limitations on solar capacity from your energy retailer, did you know you can add more panels above the limit to directly heat your hot water using a direct connection to your solar hot water tank? Not many installers know this but it is common practice for our installers to offer this as an option. You are truly better off putting in a main solar power system vs. a solar hot water system. For more information, please use the contact us link on this page to give us a call or send a message and find out more.